Disney released a Special Edition Blu-ray/DVD combo of "Toy Story" and "Toy Story 2" this week (both movies look fantastic in hi-def, BTW). 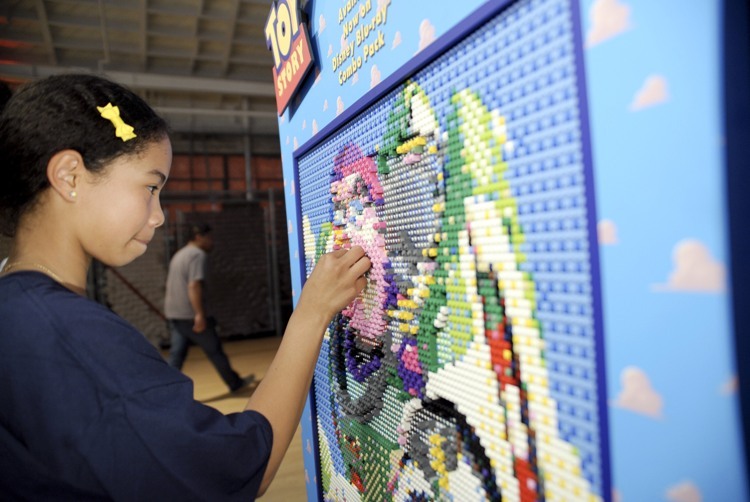 To promote the release, Walt Disney Studios Home Entertainment partnered with Boys & Girls Clubs of America (BGCA) and LEGO to construct a huge mural of the "Toy Story" characters in LEGO bricks. Six individual sections of the mural were built at Boys & Girls Clubs locations in Chicago, Houston, Philadelphia, Denver, Los Angeles and Washington, DC, before being combined together in Los Angeles. Disney has had a long-standing relationship with the BGCA. Walt himself served on the organization's board of directors in the 1960s when it was just called the Boys Club. 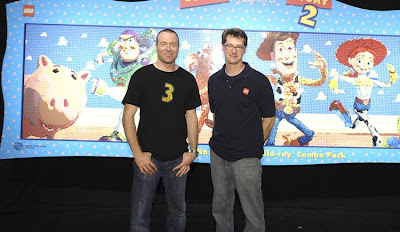 Pixar Story Supervisor Jason Katz ("Toy Story," "Toy Story 2," "Toy Story 3") and LEGO Master Builder Erik Varszegi were on hand to host the event. 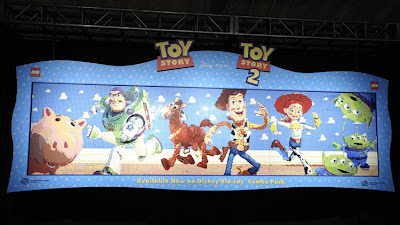 "Toy Story 3" hits theaters on June 18th. For the past 12 years, the old two-story wood and brick office building on Forest Avenue and 31st Street in Kansas City, Missouri has quietly been coming back to life. Saved from the wrecking ball after years of neglect, its crumbling walls have been shored up with steel framing and its collapsed roof repaired and replaced. For the first time in years, the building is safe from the elements. And this is just the beginning. One day, the fully-restored structure will house a museum and theater honoring a young entrepreneur who once ran a struggling animation studio inside its walls. This businessman would eventually declare bankruptcy, close up shop and head west to California, seeking his fortune in motion pictures. The Kansas City studio was called Laugh-O-gram Films. The young entrepreneur, Walt Disney. Walt and his young but eager staff occupied the old McConahy Building for just over a year, from the spring of 1922 until the summer of 1923. It was here Walt produced a handful of silent short cartoons with titles like "Puss 'n Boots" and "Little Red Riding Hood." It was also at Laugh-O-gram where Walt kept a small mouse in his desk drawer as a pet. He named the mouse Mortimer and, as legend has it (Walt himself would perpetuate the story), the furry creature would later be an inspiration for none other than Mickey Mouse. It's this tale that gives Thank You Walt Disney, the non-profit organization behind the McConahy Building restoration, its motto: "Save the house where the mouse was born." Whether you buy the story or not, there's no denying that Kansas City in general, and the Laugh-O-gram Studio in particular, were the birthplaces not only of Walt Disney's entertainment empire, but, arguably, the entire 20th century animation industry. Among Walt's colleagues at Laugh-O-gram were Ub Iwerks, Hugh Harman and Rudy Ising, each of whom would one day work for Walt's fledgling studio in California. They would be joined in Hollywood for a time by Friz Freleng, who, like Walt, also worked for a time at Kansas City Film Ad. Add to the mix Carl Stalling, the organist at the Isis Theater across the street from Laugh-O-gram and you have the core of the "Kansas City Gang" that would one day transform 20th century animation. Freleng eventually had a 30-year career with Warner Bros. as an animator and director of over 250 cartoons starring the likes of Daffy Duck, Sylvester and Tweety, and Yosemite Sam. In the 1960s, Freleng would co-found Depatie-Freleng Enterprises, creator of the animated Pink Panther. Stalling, likewise, would have a legendary career at Warner Bros., composing and adapting music for countless cartoons. But, it was his early days at Disney where he pioneered sound and music synchronization--he worked on many of the early Mickey Mouse shorts and helped Walt develop the "Silly Symphonies." Harman and Ising worked on Walt's "Alice Comedies" as well as the Oswald series. They were among the animators who jumped ship from Disney following Walt's contract dispute with his Oswald distributors in 1928. Harman and Ising would go on to form their own partnership and contract with Leon Schlesinger to create "Looney Tunes" and "Merrie Melodies" cartoons at Warner Bros. Eventually, they would both land at MGM where they would train two young animators named William Hannah and Joseph Barbera, who would go on themselves to rank among the most prolific cartoon producers of the mid-to-late 20th century. Ub Iwerks had a flair for innovation and was the most gifted animator of his time. He spent most of his career at Disney and worked extensively on the Oswald and Mickey Mouse cartoon series. His technical prowess would result in the development of the multiplane camera, the "Xerox" process for duplicating animation cels and the invention of the Circarama, or Circle Vision 360, camera. Not bad coming from a failed little animation studio in Kansas City. Dan Viets appreciates the importance of Laugh-O-gram. This attorney and lifelong Disney fan partnered with a group of friends to purchase the McConahy Building in 1998 and begin the long, slow process of rebuilding and restoring it. Says Viets, "I think it's fair to say that Walt really set the pattern for his whole career in the work he did there at the Laugh-O-gram building." The organization that Viets helped form, Thank You Walt Disney, received nearly $500,000 from Walt's daughter, Diane Disney Miller, and the Walt Disney Family Foundation to help with the restoration. "We had the privilege," says Viets, "of showing Diane and (her husband) Ron Miller many of the historic sites in Kansas City, but in particular, the Laugh-O-gram building. And it resonated with her. I can recall as we drove by that building, Diane understood and appreciated how important it was in the story of her father's life." Thank You Walt Disney has been supported by Kansas City area individuals and corporations, even local construction companies that have donated materials and services towards the restoration. It's also benefited from a series of fund-raising events, most recently a screening of the Disney documentary "Walt & El Grupo" in January at the Screenland Theatre in Kansas City. 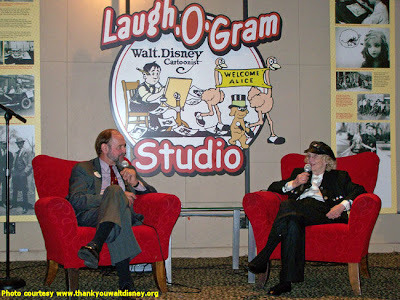 The most memorable event by far for the organization occurred last May when Thank You Walt Disney hosted a special evening with Virginia Davis, Walt Disney's first star, who appeared in the "Alice Comedies" beginning in 1923 when she was only four. Her very first film, "Alice's Wonderland," was the only "Alice Comedy" shot at Laugh-O-gram. All her subsequent films would be shot in California, once Walt convinced her and her family to move west. As Viets recalls, Davis was a complete delight and, in front of a packed audience, shared many stories about her early days working for Walt. "She was so much fun. I asked her, 'Didn't you do some modeling work for the Disney Studio?--I think it was "Make Mine Music" that had the jitterbug sequence in it.' She says, 'Yeah, you wanna see?' And then she stands up and starts jitterbugging! "It was a great occasion. We were so happy we brought her out. Her daughter told us how much fun Virginia had." This would turn out to be Davis's last public appearance. The Disney Legend passed away on August 15th at the age of 90. This spring, Thank You Walt Disney will once again bring the magic of Disney to its supporters. On May 15th, it will present an evening with newly-inducted Disney Legend Bill Farmer, the long-time voice of Goofy. A Midwesterner himself, Farmer was born in Pratt, Kansas, less than 300 miles west of Kansas City. Proceeds from the event will go towards the ongoing preservation and redevelopment of the Laugh-O-gram building. "What we feel like we've done," says Viets, "is completed the first phase of the project, which is to keep the walls standing, to save the building from the wrecking ball and to stabilize it. And that's where we are now. We can catch our breath--we don't live under the constant threat of losing the building. We're at the point where we need to find the funding, of course, to complete the interior. It's not as if the outside is finished, either, but at least it's stabilized." For more information about Thank You Walt Disney, including ways you can support the restoration, visit www.thankyouwaltdisney.org.